The RBT35 Series Blades are an excellent choice for leveling, finish grading, and backfilling applications at large feedlots, outdoor arenas, construction sites, nurseries, and maintenance operations on farms, ranches, or homeowner lanes or roadways. They are excellent for snow removal in the pulling or the push-blade mode. Their hydraulic or manual angle, offset, and tilt capability make them ideal for construction and maintenance of drainage ditches, waterways, and soil contours. They are also very effective in maintaining silage pit operations. 84 & 96 in. Working widths: Choice of two sizes to pick from. Both sizes handle large capacities. 35 to 80 HP range for 2-Wheel Drive / 35 to 65 HP range for 4- Wheel Drive: Fits a wide variety of tractors. Cat. 1 or 2: Fits wide variety of tractors. 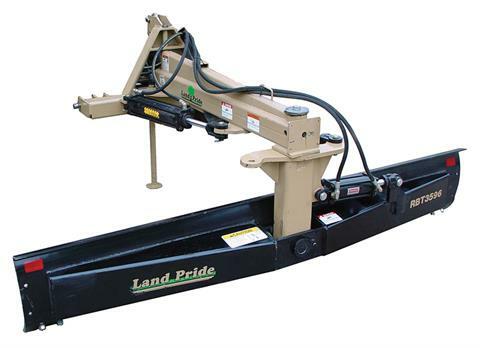 Fits Land Pride Quick-Hitch: Quick and easy attaching without leaving tractor seat. 3-Way Blade: Tilt, angle and offset features available hydraulically or manually. Blade angles left and right up to 40° manually and up to 50° hydraulically in either direction: (9 positions manually: Center, 4 clockwise and 4 counterclockwise in 10° increments)(Hydraulically: Any degree up to 50 degrees) Allows the operator to set the blade at the angle of his choice up to 40° to complete the job with satisfactory results. Blade offsets left and right up to 30 in. : (9 positions manually: Center, 4 positions left and 4 positions right) (Hydraulically: Any position up to 30”) Allows the operator to position the end of the moldboard beyond tractor tire and close to solid obstacles such as fences, buildings and abutments. Blade tilts up and down up to 20°: Allows the operator to do simple tasks such as putting a crown in the middle of a road to making V-type ditches of various sizes. Fully welded main frame (Tubular construction): Fully welded adds overall strength and rigidity to blade frame. Heavy-duty pivot assembly with 3 in. solid steel kingpin: 0.25 in. Plate steel turntable and 3 in. kingpin for handling the high amount of torque that can be transferred to this area. Formed 17 in. 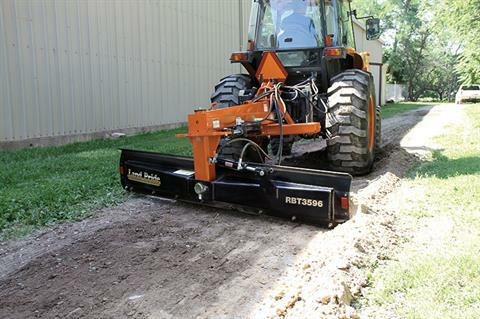 Moldboard:` Precisely formed moldboard rolls dirt and debris with ease. 0.31 in. Moldboard thickness with box reinforcement: Thick material with fully welded box reinforcement creates a strong moldboard. Reversible cutting edge: Get twice the wear from the cutting edge by flipping it over. 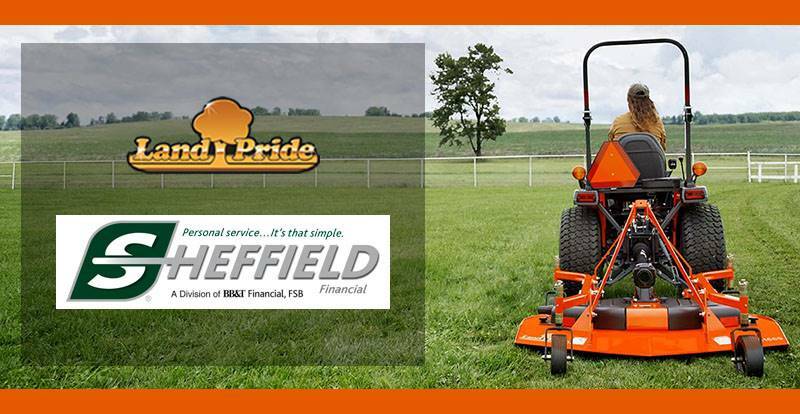 Retractable parking stand: Able to store the unit with the frame off the ground, also aids in attaching to tractor. With manual links - 745 lb. Max. G.V.W. - 9,500 lbs.